Birthday noshing should go on for a week at a minimum. At the end of the week, I had a chance to catch up with a friend for breakfast. We went to Tom's Urban 24 since neither of us had been there before. Going out for breakfast (and its close cousin, brunch) is a wonderful thing. However, it involves mornings - most of the time. Since you have to get up for work anyway, why not get up a little earlier and go out for breakfast? You can try new places without the waits that hit the good breakfast places on the weekends. 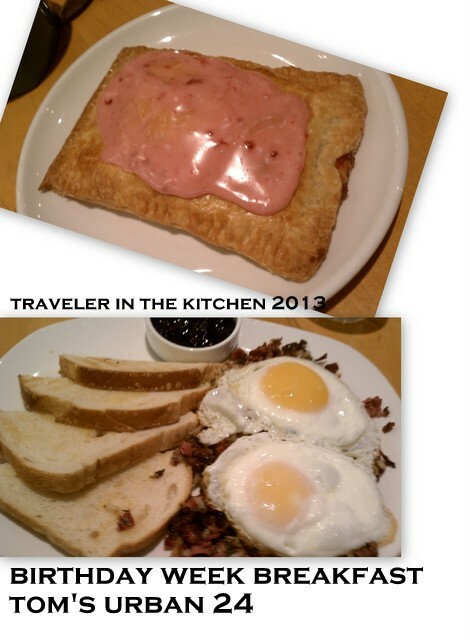 Tom's has home made pop tarts on their menu. Pop Tarts!!! These are not the sad, flat , processed tarts that I ate throughout college. This is hot breakfast pastry. Raspberry in my case. My corned beef hash was also real tasty. Another breakfast victory here in Denver! Long live coffee, breakfast and friends.